iHEAR MAX - Practically Invisible Mini behind-the-ear Hearing Device. Designed and Manufactured in the USA. The iHEAR MAX features a versatile 100% digital sound processing core technology that can be customized at home using the patented online iH-TUNER platform. Advance technology features include Automatic Feedback Cancellation, Telecoil for telephone & audio loops, Digital Noise Reduction, and 4 customized sound profiles. 30 day Money Back Guarantee, free technical support, 1 Year Warranty, 1 month supply of batteries & assorted ear tips (domes) to fit various ear canal sizes. The iHearMAX features the first web enabled hearing technology on the market. Our advanced patented online process allows you to individualize sound settings from home (or anywhere with Internet Connection) using your personal computer and the programming kit. Customize the iHEAR MAX hearing device by installing the iH-TUNER application online to stream audio and customize the sound settings based on your own perception of loudness, speech clarity, and intelligibility for male and female voices. The online sound settings software supports Windows and Mac operating systems. We currently do not support tablets or smartphones. Having problems setting up your device? No problem. Technical and professional support are available to assist you in customizing your hearing device. Designed and Manufactured in the USA. 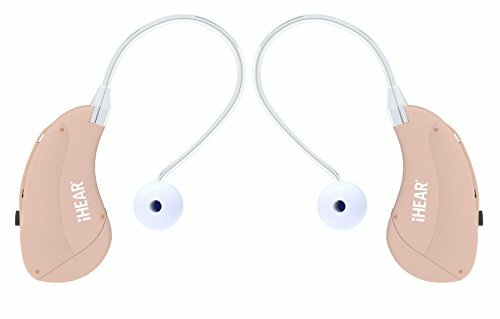 The iHEAR MAX (Beige Pair, Standard Length Clear Wire) is a pair of miniature behind-the-ear hearing devices, virtually invisible, featuring 100% digital sound technology. This device is not suitable for individuals with profound hearing loss and under the age of 18. Not sure about your hearing ability? Take the iHearTest first. 30-day complimentary Professional Support, Unlimited Technical Support, 1 Year Warranty, 2-month supply of batteries and 1-month supply of ear tips. Support, Shipping & Warranty Services not available outside of USA. Options to customize settings are available. Contact seller for details. Select the Petite Clear Wire sizing option if you are under 5'3" or have small size ears. Choose "Petite Wire" from the "2 sizes" dropdown menu under the price listing. If you have any questions about this product by iHEAR, contact us by completing and submitting the form below. If you are looking for a specif part number, please include it with your message.